Bandung has so much surprises for the traveler and if you want something out of the ordinary, why not visit two volcanic craters? Kawah Putih and Tangkuban Perahu are two of the very accessible volcanoes in this city. Kawah Putih stuns with its white to bluish to greenish crater lake while Tangkuban Perahu, the drive up volcano, so to speak, gives you that raw feel. I got excited when we were already heading to Ciwidey, passing through villages and fields as the temperature started to drop. It was morning and the rising sun gave the mountain landscape a beautiful sheen, mist just starting to rise and the nippy cold weather kissing my cheeks. I’ve seen photos of Kawah Putih before and the two hour drive/50 kilometer distance is made bearable with the beautiful scenery as our bus slowly made the ascent to the starting point for the crater lake. Kawah Putih is a stunning crater lake that can turn white, greenish to bluish, depending on the concentration of sulfur or the temperature and is one of two craters of Gunung Patuha at 2,430 meters in elevation. It’s a very alien landscape with its acidic lake giving a very surreal scenery. Sulfuric vents emanate gases at the edge while trees, mostly devoid of leaves at one area grow at the edge. You can’t go directly to Kawah Putih. One has to ride the many red shuttle angkut after paying the entrance fee. These vehicles then ferry visitors to the drop off point and is just less than a hundred meters from the crater lake itself. What I do love about the place is the cool weather but the smell of sulfur as one goes down the steps to the lake can be hard on the nose, thus you have the option to use a mask. However, unlike in Kawah Ijen, where a gas mask is a must, the smell is actually bearable. Weekends can get crowded with several visitors from Jakarta descending on the capital and to Kawah Putih. If you want to skip the crowds, weekdays are better. It’s a very pleasant drive up Gunung Tangkuban Perahu, around 32 kilometers and about an hour and fifteen minutes from the capital city of Bandung, passing modern buildings, towns, fields and forests, with the temperature dropping to a comfortable cool the farther you go up. Unlike going to Kawah Putih, you can drive all the way to the edge of the crater where there is ample parking space, canteens and just about every tout selling you souvenir items. 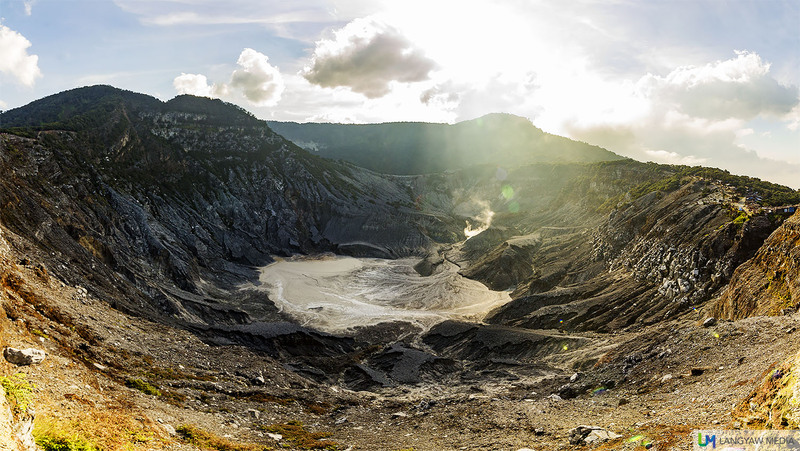 Gunung Tangkuban Perahu is so called because it looks like an upturned boat from a distance and is 2,084 meters above sea level with the last known eruption just last year. There are actually three craters of which Kawah Tangkuban Peraho is the most prominent and directly viewable from the top. It can be daunting to look down as the fenced off area/viewdecks around the crater is mostly within or even less than a meter from the edge. The crater is barren and dreary. Grayish and sad with a few fumaroles. Bandung has so many surprises, u can even visit 2 volcanic craters! Have you been to this alienlike crater lake in Bandung? Have u looked down the crater of this active volcano?